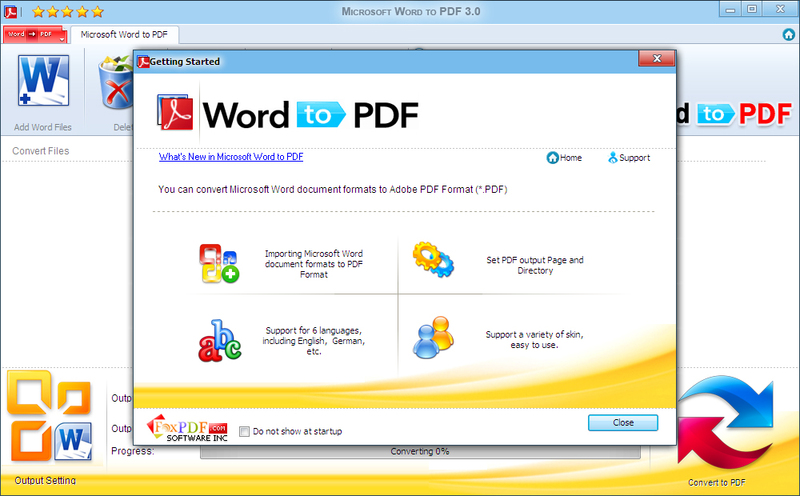 Microsoft Word to PDF 3.0 Free Download - Batch Turn any Word file into a high quality PDF that works in all PDF readers. Microsoft Word to PDF can batch Turn any Word file into a high quality PDF that works in all PDF readers. Microsoft Word to PDF is the best solution for converting Word to PDF, doc to PDF, docx to pdf, rtf to pdf, text to PDF, Converting documents from Microsoft Word to PDF format gives you the ability to email documents to customers in change-protected mode, to replicate presentation materials in print shops without any troubles with missing fonts or broken layouts. Plus, converting documents from Word to PDF allows you to prepare them for archiving. Microsoft Word to PDF Software is the most complete solution for the conversion of word documents into Adobe PDF. Microsoft Word to PDF is easy to use. Just click the button to canvert your PDF. Microsoft Word to PDF Software preserves your links and keeps them working in the resulting PDF file. Whether they point to a web page, or internal links to a target cell in the sheet. Microsoft Word to PDF can set Two Types of Password. Microsoft Word to PDF is compatible with Microsoft Windows 2000, XP, Vista, Windows 7, Windows 8, as well as Microsoft Word 2000, Word 2003, Word 2007, Word 2010, Word 2013. Statement: First, please download the orginal installation package by clicking the download link. Of course you may also download it from the publisher's website. Using Microsoft Word to PDF crack, key, patch, serial number, registration code, keygen is illegal. The download file hosted at publisher website. We do not provide any download link points to Rapidshare, Hotfile, Depositfiles, Mediafire, Filefactory, etc. or obtained from file sharing programs such as Limewire, Kazaa, Imesh, Ares, BearShare, BitTorrent, WinMX etc. Software piracy is theft. If you like Microsoft Word to PDF please buy it.